• Key indicators that affect the perception of service quality in critical airport areas of passenger boarding, by Michelle Carvalho Galvão da Silva Pinto Bandeira*, Giovanna Miceli Ronzani Borille, Marina Ciarlini Duarte Maia, Rodrigo Flório Moser [paper in Portuguese]. • Applying a new merger simulation model to the airline industry, by Sergio Aquino de Souza* [paper in Portuguese]. 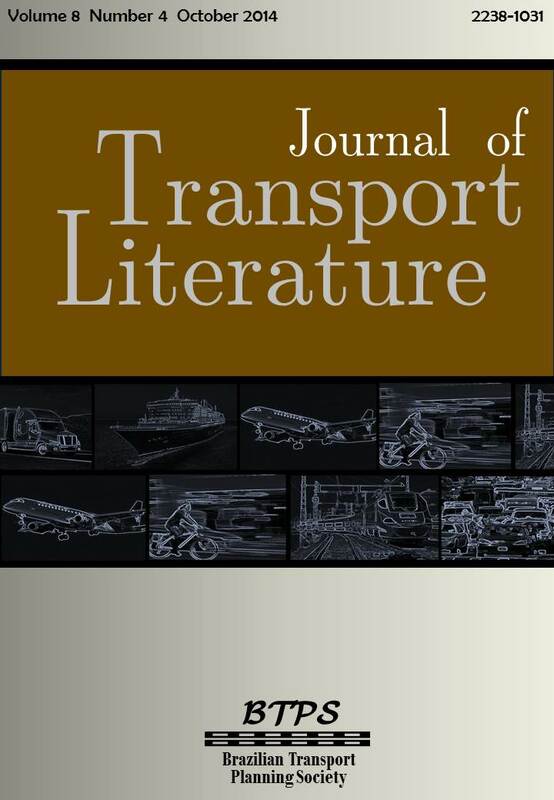 • Evaluating land transport of general cargo in Brazil using a market share model, by Brunno Santos Gonçalves*, Márcio de Almeida D´Agosto, Ilton Curty Leal Jr., Francisco Gildemir Ferreira da Silva [paper in English]. • An heuristic model based on localization-designation applied to a rotating parking lot, by Liliane Silva de Antiqueira*, Elaine Corrêa Pereira, Catia Maria dos Santos Machado [paper in Portuguese]. • Proposed methodology to evaluate the benefits of an urban distribution center for mitigation of city logistics problems, by Leise Kelli de Oliveira*, Vagner de Assis Correia [Paper in Portuguese]. • The effect of air cargo traffic on regional job creation in Turkey, by Ismail Cagri Ozcan* [Paper in English]. • Viability analysis of popular cooperatives in the participation of residual frying oil to biodiesel plants supply chain, by Ricardo César da Silva Guabiroba, Márcio de Almeida D’Agosto, Luíza Santana Franca* [Paper in Portuguese]. • Costs and freights charged in road cargo transportation: a comparative analysis between owner operators and companies, by Maria da Penha S. Araújo, Renata Albergaria de Mello Bandeira*, Vania Barcellos Gouvea Campos [Paper in Portuguese]. • A study of different metaheuristics to solve the urban transit crew scheduling problem, by Gustavo Peixoto Silva*, Allexandre Fortes da Silva Reis [Paper in English]. • The potentialities of chinese airline market for Lisbon International Airport: the empirical modeling analysis, by José Manuel Vicente*, Andreia Dionísio, Manuela Oliveira, Cátia Simão [Paper in Portuguese]. • Methodology for estimating freight flows from secondary data: an application in Belo Horizonte, by Lílian dos Santos Fontes Pereira, Leise Kelli de Oliveira* [Paper in Portuguese]. • A complementary metric to define a buffer zone in Brazilian airports, by Luiz André de Carvalho*, Jules Ghislain Slama, Carlos David Nassi [Paper in English]. • Evaluation of bidding processes for hiring offshore support vessels using data envelopment analysis models, by Gustavo da Silva Maciel , Gilson Brito Alves Lima, Lidia Angulo Meza, Silvio Figueiredo Gomes Júnior* [Paper in Portuguese].